I am not a registered dietitian. Nor am I a pediatrician. Yet, I am deeply dismayed that both the Academy of Nutrition and Dietetics (AND) and the American Academy of Pediatrics (AAP) allow junk food purveyors to be financial sponsors of your professional organizations. I’m hardly the only one who is concerned. Many of your own members are troubled by your organizations’ sponsorship policies — policies that allow companies that peddle unhealthy food and drink such as PepsiCo, Coca-Cola, Nestlé and McDonald’s, to donate money in order to gain coveted sponsorship status and exhibit space at your yearly conferences. For example, this year Coca-Cola had a large booth at both of your yearly expos. Pepsi also had a booth at the AND expo, while McDonald’s and Nestle were listed as sponsors of the AAP conference. Even more alarming, some of these junk food purveyors are allowed to sponsor your continuing education courses and conference sessions. For example, Coca-Cola has long been a sponsor of credited continuing education sessions for dietitians through AND. And Nestlé, which manufactures and heavily markets a wide array of junk food and baby formula, just sponsored a symposium at the AAP conference titled, “Preventing Pediatric Obesity: Communicating Effectively With Parents.” (It should be noted that evidence links breastfeeding to healthier weight infants and children, which makes AAP accepting money from a formula-maker even more problematic.) Both of these session sponsorships make about as much sense as BP tutoring schoolchildren on how to protect the environment! As a long-time food reformer, I can tell you that both of your organizations’ sponsorship policies are disturbing to not only many pediatricians and dietitians, but to a growing universe of public health officials, nutrition advocates and parents. When a professional organization accepts money from junk-food manufacturers, it casts a cloud across your professional credentials. How do we know that your professional advice on proper nutrition isn’t tainted by your dependence on financial support from the likes of Coca-Cola, Nestlé, Pepsi and McDonald’s? 1. Meet with concerned members of your organizations and listen. 2. Ban junk food exhibitors like Coca-Cola and Pepsi, from your yearly expos. Coca-Cola booths on the expo floor of a nutrition conference or a pediatrics conference are the definition of cognitive dissonance. Ban junk food manufacturers from exhibiting at your expos. Special note for AND’s leadership, which this year instituted a new rule — no photography in the expo hall. 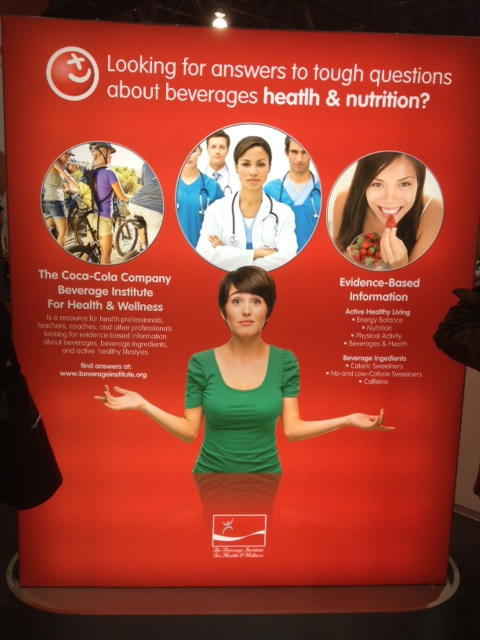 If some of your sponsors, like Coca-Cola and Pepsi, have exhibits so embarrassing to a nutrition conference that you don’t want their photos taken, it’s time to revamp your sponsorship policy. 3. Identify other possible sponsors to replace junk food manufacturers. There’s a whole universe of more appropriate sponsors you could reach out to beyond those who peddle junk food, including fruit and vegetable trade groups or companies that sell only whole, minimally processed foods. You may need more of them to replace the money you received from deep-pocketed companies like Nestlé and McDonald’s, but at least you won’t be sending out conflicting nutritional messages to your members and the rest of the nation. 4. Poll your members to determine if they would be amenable to higher yearly dues, in order to eliminate junk food/formula sponsors. Determine how much you’d have to raise yearly dues if you eliminated junk food/formula financial sponsorship. Then poll your members to see if they’d be willing to absorb that yearly cost. A number of dietitians and pediatricians have already publicly suggested that they’d be willing to pay more to end inappropriate sponsorships. 5. Create a task force to review your policy on sponsorships and make recommendations for change. Sponsorship is an issue that has reached critical mass for both AAP and AND. Create an internal task force to review your current sponsorship policy and make suggestions on how to improve it. Make sure the task force is ideologically well balanced and includes critics of your current policy. Direct the task force to prepare a full report of its findings and recommendations, and make the report available to all of your members. I hope 2014 is the year that AND and AAP begin to seriously discuss and assess your damaging sponsorship policies, and take steps to restore confidence in both of your organizations. Americans depend on dietitians and pediatricians for sound nutritional guidance. When your organizations take money from junk food manufacturers it is embarrassing to your members, detrimental to your reputations and harmful to the health of Americans.